Diamond Details: 37 Round cut brown diamonds, of exquisite color weighing .85 carat total. Pendant Details: Charles Krypell sterling silver design with a textured finish. Measurements: Leather chord chain measures 17 inches in length. This beautiful Charles Krypell sterling silver pendant necklace features 37 round cut brown diamonds, of exquisite color weighing .85 carat total. 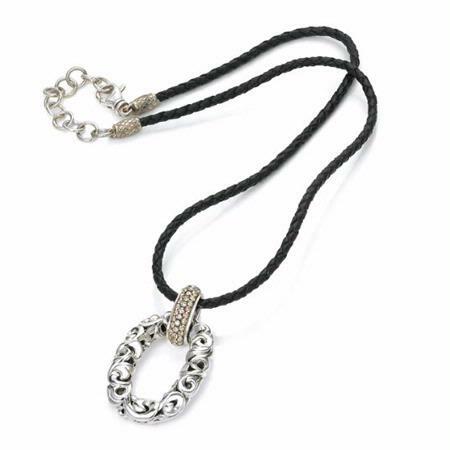 The leather chord chain measures 17 inches in length. We are an authorized Charles Krypell dealer. Please call for pricing 1-800-790-6980 or 1-212-302-2863.